Despite scoring five goals against Trafford, Bamber Bridge boss Neil Reynolds was more impressed with his side’s defensive work. The men from Irongate enjoyed a comprehensive 5-0 win on Saturday at the Sir Tom Finney Stadium – against a team, who are pushing for a play-off place in the NPL First Division North. Five different names were on the scoresheet, but Reynolds was delighted with the way his men were able to press their opponents into submission. “We had five different scorers, but the thing which I was so pleased was the way we defended from the front. “We defended high against their back four and intercepted the ball,a couple of our goals came from us winning the ball back, which enabled those chances to be created. “It is something we work on in training – we work on our distances from each other so that when we do press, it’s a dhort run for the next man. “It’s knowing when it’s time to press the ball and when it’s not time to press. “The fitness levels of the lads are ridiculous. But it was great to see five different lads on the scoresheet. “Kieran Charnock got his first goal for the club; lewis Nightingale scored on his home debut. “Chris Marlow scored within 30 seconds of coming on to the pitch, Regan Linney and Matt Dudley also both scored. 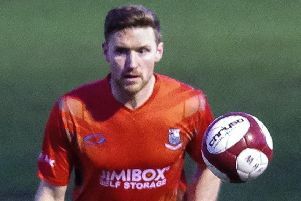 “It was great result for us – we knew going into these last three games against Droylsden, Glossop North End and Trafford that it was going to be a tough challenge against three teams all pushing for the play-offs. “So to come out of it with seven points from nine –it’s waht we wanted.” Brig were due to face Atherton Collieries in the League Cup last night, but for the third time, the match was postpone. Reynolds may now request that the game gets switched to the Sir Tom Finney Stadium. On Saturday, Brig host Skelmersdale United.